Microglia are emerging as key players in neurodegenerative diseases, such as Alzheimer's disease (AD). Thus far, microglia have rather been known as modulator of neurodegeneration with functions limited to neuroinflammation and release of neurotoxic molecules. However, several recent studies have demonstrated a direct role of microglia in “neuro” degeneration observed in AD by promoting phagocytosis of neuronal, in particular, synaptic structures. While some of the studies address the involvement of the β-amyloid peptides in the process, studies also indicate that this could occur independent of amyloid, further elevating the importance of microglia in AD. Here we review these recent studies and also speculate about the possible cellular mechanisms, and how they could be regulated by risk genes and sleep. Finally, we deliberate on possible avenues for targeting microglia-mediated synapse loss for therapy and prevention. Alzheimer's disease (AD) is the most common neurodegenerative disorder; and because of its high costs toward patient care and management, it is among the top devastating diseases (Scheltens et al., 2016). While the definitive etiology is still to be uncovered, several characteristic features, such as abnormal intraneuronal cytoskeletal changes, known as neurofibrillary tangles, and extracellular protein deposits called amyloid plaques (Hardy and Higgins, 1992; Gandy, 2005), define the disease. Genetic evidence from the familial forms of AD suggests that the formation of the longer variants of the peptide called β-amyloid (Aβ) that nucleate amyloid plaques could play a causative role (Hardy and Higgins, 1992; Price et al., 1998; Tanzi, 2012). The major risk factors for developing AD are aging and a family history of the disease. More than 95% of all AD cases occur in individuals over the age of 60 years and are defined as sporadic AD or late-onset AD. Less than 5% of cases are defined as familial AD and can be seen in patients as young as 30 years of age. In the majority of cases the inheritance of familial AD shows autosomal dominance, either in the amyloid precursor protein (APP) or Presenilin 1 (PSEN1), or Presenilin2 (PSEN2) genes (Bertram et al., 2010; de Strooper, 2010). Allelic distribution of Apolipoprotein E (ApoE) on chromosome 19 has been identified as an additional genetic risk factor associated with sporadic AD (Roses, 1996). In the case of late-onset AD, genome-wide association studies have identified several genetic polymorphisms in various gene loci that are associated with increased AD risk (Guerreiro and Hardy, 2011). Given that late-onset AD is not associated with strong disease-causing mutations that usually increase the production of the longer Aβ peptides (Bali et al., 2012), it could arise from defective clearance of amyloid and, thus, account for the higher amyloid load observed in AD patients. In the context of amyloid clearance, several mechanisms have been studied: for example, efflux out of the brain through lipoprotein receptor-related proteins (LRP receptors), amyloid-specific degrading enzymes, such as insulin-degrading enzyme, Neprilysin, and Aβ clearance through microglia (Tarasoff-Conway et al., 2015). In the case of microglial removal of amyloid, phagocytosis is one of the well-studied mechanisms (Ries and Sastre, 2016). The presence of microglia around amyloid plaques has been largely documented both in humans and in transgenic mouse models that overexpress mutated human APP (Dickson et al., 1988; Haga et al., 1989; Frautschy et al., 1998; Stalder et al., 1999; Serrano-Pozo et al., 2013). Their exact function around the plaques, however, is still not understood. Some studies have reported the rapid recruitment of microglia around newly formed plaques, by using longitudinal in vivo imaging in the brain of AD mouse models (Meyer-Luehmann et al., 2008). Microglia, the major phagocytes of the brain, are indeed equipped with a variety of receptors able to bind and phagocytose Aβ (Lee and Landreth, 2010; Doens and Fernández, 2014; Yu and Ye, 2015). However, in vivo two-photon imaging studies have revealed that Aβ deposition coincides with functional impairment of microglia, suggesting that, in advanced pathological stages, microglia become unable to remove and clear the amyloid burden (Krabbe et al., 2013). By replenishing hippocampal organotypic slices with acutely isolated microglia, Hellwig et al. (2015) elegantly showed reduced phagocytic capacity to clear Aβ in microglia isolated from AD mouse brains, suggesting that a long exposure to the amyloid load is responsible for such impairment. Interestingly, a reduction in microglia number in 3xTg-AD mice (∼30%) did not lead to significant changes in amyloid burden but improved cognition, suggesting that microglia might contribute to the cognitive dysfunction also via Aβ-independent mechanisms (Dagher et al., 2015). In the last few years, microglia have emerged as important players in pruning synapses during early brain development. Selective manipulation of microglial genes has indeed revealed a critical role for these cells in refining neural circuits through removal of supernumerary synaptic connections (Paolicelli et al., 2011; Schafer et al., 2012). During development, microglia-mediated synapse loss represents an important physiological process required for proper brain maturation. Mice lacking the microglial receptor Cx3cr1, for example, exhibit a significant reduction in microglial number and a transient increase in dendritic spine density in the postnatal hippocampus, associated with long-lasting defects in brain connectivity, as a consequence of defective synaptic pruning by microglia (Paolicelli et al., 2011; Zhan et al., 2014). Neural activity is critical for synapse removal, with its inhibition by TTX or stimulation by forskolin promoting or reducing, respectively, the fraction of synaptic terminals engulfed by microglia in the dorsolateral geniculate nucleus (Schafer et al., 2012). Monocular deprivation has also been shown to effectively promote engulfment of synaptic elements by microglia in wild-type (WT) but not in mice lacking the purinergic receptor P2y12, suggesting that microglia-mediated synaptic refinement is occurring during visual plasticity and requires P2RY12 (Sipe et al., 2016). The molecules that mediate synapse removal by microglia are still under investigation. The best characterized, so far, are the components of the complement cascade (Stevens et al., 2007; Stephan et al., 2012). C1q and C3 KO mice exhibit sustained defects in synapse elimination and refinement of neural circuits (Chu et al., 2010; Schafer et al., 2012; Bialas and Stevens, 2013). Recently, C4 has been also implicated in mediating synaptic removal, with C4 variants associated with the risk to develop schizophrenia (Sekar et al., 2016). Evidence for the involvement of the complement pathway. Recent studies suggest that microglia-mediated synapse removal, normally confined to the activity-dependent refinement during brain development, can be reactivated in aging or in disease. The expression profile of complement mediators, such as C1q and C3, has been shown to follow a peculiar trajectory, with high levels during development and aging, but a very low baseline expression across the adult lifespan (Johnson et al., 1994; Reichwald et al., 2009; Naito et al., 2012; Schafer et al., 2012; Stephan et al., 2013), thus supporting a reactivation of complement-mediated mechanisms later in life. Interestingly, in AD mouse models, C1q and C3 are highly upregulated, paralleling Aβ deposition (Reichwald et al., 2009). Although no substantial changes in Aβ load are reported in AD mouse models lacking C1q (Fonseca et al., 2004), C1q ablation seems to exacerbate amyloid deposition in a model of aberrant transthyretin deposition (Panayiotou et al., 2017). Despite the controversial effects on amyloid burden, in both models, C1q depletion is associated with reduced microglia/macrophage activation. AD mice lacking C1q, moreover, display reduced synapse loss, supporting a role for C1q in mediating synapse removal (Fonseca et al., 2004). Consistently, mice injected with Aβ oligomers exhibited synaptic loss in the hippocampus, and this was rescued in animals treated with either anti-C1q antibody or genetically depleted of C1q (Hong et al., 2016). Recent work shows that C3 depletion in a mouse model of AD significantly reduces synapse loss and promotes cognition, despite accumulation of the amyloid burden (Shi et al., 2017). To study the effects of complement in the later stages of AD, Shi et al. (2017) used a mouse model of AD (APP/PS1) lacking C3 and found that, at 16 months of age, despite the increased amyloid load, C3 deficiency protected the animals from synapse loss and rescued cognitive deficits. Mechanistically, Aβ, probably specifically Aβ oligomers, increases the expression of C3 in microglia and astrocytes, and this, in turn, marks the synapses, promotes microglia recruitment, and mediates synapse elimination (Fig. 1). Indeed, injection of Aβ oligomers in wild-type mice leads to upregulation of C3 levels, which promote microglial removal of synaptic connections (Hong et al., 2016). In this model, the loss of synapses correlates with increased engulfment of the postsynaptic protein homer by microglia (Hong et al., 2016). While C3 deficiency seems to behoove protection against synaptic loss, even in the presence of increased Aβ levels as described by Shi et al. (2017); Czirr et al. (2017) recently showed that C3 deletion in APP transgenic mice actually reduced phagocytic activity in microglia but increased Aβ degradation. The authors attribute this enhanced Aβ degradation to increased levels of tissue plasminogen activator. While these two studies differ on their findings related to Aβ, the fact that C3 deficiency reduces phagocytic activity and thus protects synapse removal is intriguing. Other complement pathway-associated molecules are also implicated in AD, providing a solid support for the involvement of the entire complement cascade, and not just C3 or C1q. Copy number variation studies on the two isoforms of complement 4 (4A and 4B) show that these genes exhibit a statistically significant increase in copy number variations in AD populations (Zorzetto et al., 2017). Uptake of fibrillar Aβ is mediated through the C3 receptor (CD11b) in microglia and CD88, the receptor for C5a, which is upregulated around the plaques and thus correlates with amyloid (Ager et al., 2010) and neurofibrillary pathology (Fonseca et al., 2013). Interestingly, inhibiting the C5aR pathway with the antagonist PX205 reduced both amyloid pathology and neurofibrillary tangles (hyperphosphorylated tau) and improved behavior in AD mouse models (Fonseca et al., 2009). Similar improvement was also described when mice were immunized actively with peptides derived from C5a (Landlinger et al., 2015). While most of these latter studies have not looked at microglial removal of synapses influenced by complement, it is tempting to imagine that this would be the case, and that inhibiting this pathway or its components would result in the protection of synapses. Diagram depicting the role of microglia (yellow) in supporting synapse homeostasis under physiological conditions (left). Pathological role (right) is influenced either genetically through late-onset AD risk genes or through sleep deprivation. Top right, Phagocytic uptake of synaptic structures by microglia, aided by Aβ, complement molecules, C1q and C3. A possible role for APOE is here proposed. Inset (zoomed), Possible tagging mechanism of synaptic structures by Aβ and complement. Bottom right, Synapse loss mediated by soluble factors or by loss of trophic support. Aβ oligomers: a possible role for synaptic tagging? The synaptotoxic role of Aβ, specifically in its oligomeric conformation, has been extensively discussed in the last decades (De Felice et al., 2008; Zhao et al., 2008; Wilcox et al., 2011; Forny-Germano et al., 2014) and has been primarily attributed to synapse inactivation by targeting postsynaptic glutamatergic receptors (Decker et al., 2010; Li et al., 2011). However, the possibility that Aβ oligomers might also serve as a direct tag on synapses to promote microglia-mediated removal has not yet been addressed. Double-label immunofluorescence studies have shown that >90% of Aβ oligomers colocalize with PSD-95, a marker of dendritic spines, revealing a highly selective synaptic targeting, and ∼50% of PSD-95-positive synaptic terminals were targeted by Aβ oligomers, showing that synapses targeted by Aβ oligomers were approximately half of the synapses (Lacor et al., 2004). High-resolution 3D imaging, indeed, provides evidence that intracellular fibrillar Aβ aggregates pierce the cell membrane at the synaptic site (Capetillo-Zarate et al., 2011). Localization of Aβ oligomers at the postsynaptic structures evidently correlates with synaptic loss both in humans as well as in AD mouse models (Koffie et al., 2009, 2012). Mechanistically, Aβ binds to glutamatergic receptors at the postsynaptic site leading to their inactivation (Decker et al., 2010; Li et al., 2011) in a calcium-dependent manner (Birnbaum et al., 2015). In addition, it could act as an extracellular hook that recruits microglia to the synapse and, thus, induces the removal of the Aβ-tagged synapse. In a more complex scenario, one could envision that fibrillar Aβ first recruits complement molecules, which in turn promote microglial recruitment (Eikelenboom and Veerhuis, 1996; Stoltzner et al., 2000). Because C3 is a known mediator for microglial phagocytosis of fibrillar Aβ (Maier et al., 2008; Fu et al., 2012), it is possible that Aβ oligomer deposition at the synapse induces not only microglial recruitment but also, via upregulation of C3, promotes engulfment of synaptic structures (Fig. 1). Aβ-independent mechanisms of microglia-mediated synapse loss. In a context where no preexistent amyloid pathology (e.g., proteinopathies) might be ascribed as the direct culprit for synapse loss, one possibility is that intrinsically dysfunctional microglia might be a trigger. Clues for this possibility come from many studies (see below). Pruning of synapses by microglia during early development (Paolicelli et al., 2011; Schafer et al., 2012) already suggests that this physiological role of microglia occurs well before aging or amyloid deposition; thus, its reactivation during aging might not necessarily depend on amyloid. Indeed, we recently showed that selectively depleting TDP-43 in a microglial cell line induced an aberrant phagocytic phenotype, which results in enhanced amyloid clearance (Paolicelli et al., 2017). Mice expressing mutant APP and lacking microglial TDP-43 displayed enhanced clearance of amyloid but, at the same time, showed significant synapse loss. Interestingly, the deposition of amyloid is not necessary, as a similar synaptic loss was observed in mice that did not express any human mutant APP (Paolicelli et al., 2017). Similarly, Shi et al. (2017) recently showed that 16-month-old AD mice deficient in complement C3 had less synaptic loss and showed better performance in behavioral tests of memory, despite enhanced amyloid load. This again suggests that synapse loss might not necessarily follow the trajectory of amyloid buildup. Microglia-derived soluble factors as a trigger for synapse loss. Synapse loss can be mediated by microglial phagocytosis, as a consequence of direct synaptic removal, likely in response to receptor-mediated recognition of a specific molecular tag at the synapses. However, another possibility, which does not exclude the former, is that microglia might also release soluble synaptotoxic factors, ultimately promoting synapse loss. A large number of in vitro assays have indeed shown that conditioned medium from activated microglia might be sufficient to induce synapse loss in primary neuronal cultures. Soluble factors, such as TNF-α, nitric oxide, and IL-6, released by microglia in the medium are indeed able to induce loss of synapses (Azevedo et al., 2013; Wang et al., 2015). Recent data also show that activated microglia release soluble factors, identified as IL-1α, TNF, and C1q, able to induce A1 neurotoxic astrocytes (Liddelow et al., 2017). On the other hand, soluble factors released by microglia could be critical for synapse maintenance, so that dysfunction in homeostatic microglial activity may lead to lack of such support, thus contributing to synapse loss. Microglial are an important source of activity-dependent release of BDNF, and conditional mice lacking microglial-derived BDNF displayed altered synaptic plasticity (Parkhurst et al., 2013). C3 deficiency has been shown to inhibit phagocytosis but still reduce Aβ levels by releasing Aβ-degrading enzymes (Czirr et al., 2017), and mechanisms similar to this could positively or negatively regulate synapse loss through such secretory systems. Because a number of mechanisms might influence microglia-mediated synapse loss, here we discuss factors, both genetic and lifestyle, which could regulate this process. For this part of the review, we focus on ApoE as an example for the late-onset risk (genome-wide association study risk) genes for AD on the genetic side and sleep as a lifestyle factor (see Dual Perspectives companion article by Vanderheyden et al.). Mutations in genes associated with early-onset AD (APP, PSEN1, PSEN2) lead to the overproduction of the amyloidogenic Aβ42 peptide, but genes associated with late-onset AD do not seem to be involved in increased production of Aβ42 (Bali et al., 2012). Indeed, several of the risk genes associated with AD, such as ApoE and TREM2, seem to be expressed in, or depend on, microglia for their expression (Efthymiou and Goate, 2017). Among the risk genes, APOE is the gene where the ε4 allelic variant confers the highest risk for late-onset AD and, interestingly, is also expressed by microglia (astrocytes being the most predominant cells that express APOE). ApoE is a major regulator of lipid homeostasis present in three allelic variants ε2, ε3, or ε4; and although its function is varied (for review, see Lane-Donovan and Herz, 2017), it primarily transports cholesterol to neurons via specific ApoE receptors. In addition to lipid binding, ApoE also play a role in Aβ metabolism, with ApoE ε4 carriers having significantly higher Aβ deposition than noncarriers (Schmechel et al., 1993; Kok et al., 2009). Interestingly, in a model of acute LPS injections, mice expressing the human ApoE ε4 displayed significantly higher synapse loss, compared with ApoE ε2 or ApoE ε3, associated with increased microgliosis and astrocytosis (Y. Zhu et al., 2012). Deeper investigations revealed that the different ApoE isoforms critically affect the levels of C1q and the phagocytic capacity of astrocytes (Chung et al., 2016). It remains to be tested whether, under these conditions, the phagocytic activity of microglia is enhanced, and directed to synapses in a C1q-dependent manner (Fig. 1). When >50,000 synapses from AD patients were analyzed using array tomography, it was not only found that patients with the ApoE ε4 have higher levels of Aβ oligomers but also that ApoE ε4 correlates with increased localization of Aβ oligomers to synapses (Koffie et al., 2012). These authors also elegantly demonstrated, both in mice as well as in humans, that Aβ oligomer accumulation correlated with synaptic loss (Koffie et al., 2009, 2012) (Fig. 1). It is thus tempting to surmise that ApoE ε4 cooperates with Aβ oligomers in recruiting microglia and inducing microglia-mediated synapse loss. Evidence for this is currently missing but would be worth investigating whether ApoE ε4 drives microglia recruitment, expression of complement factors, and thus synapse elimination seen in AD. Bonham et al. (2016) found a significant interaction between APOE ε4 and C3 in CSF in both amyloid and tau pathology, strengthening the idea of synergistic influence of APOE and Aβ on C3-mediated synapse loss accounting for neurodegeneration in AD (Fig. 1). A recent study reported that the APOE pathway plays a critical role in mediating the switch from a homeostatic to a neurodegenerative microglia phenotype observed in AD, triggered by TREM2-mediated phagocytosis of apoptotic neurons (Krasemann et al., 2017). Whether a similar switch in microglia might in turn affect synapse elimination remains to be investigated. Several factors, such as aging, nutrition, infections, inflammation, chronic stress, and sleep, all contribute to the multifactoriality of AD. Sleep is arguably one of the most influential factors that are associated with the risk for neurodegenerative diseases (Holth et al., 2017). Live imaging studies in the adolescent mouse cortex report that sleep is associated with reduction in dendritic spine number, whereas wakefulness promotes synaptic formation, clearly establishing a critical role for sleep and wake states in synaptic remodeling (Maret et al., 2011). Intriguingly, such alternation in synaptic density, higher in the awake phase and lower in the sleep state, is disrupted in mice lacking the microglial-specific lysosomal protease Cathepsin S, providing evidence for the implication of microglia in mediating sleep-dependent synapse refinement (Hayashi et al., 2013). Several studies have shown the relationship between sleep quality and risk for AD (Osorio et al., 2011; Lim et al., 2013; Spira et al., 2013; Minakawa et al., 2017). Genetic risk factors, particularly, ApoE ε4, have been shown to interact with sleep (Kadotani et al., 2001; Lim et al., 2013; Achariyar et al., 2016). ApoE ε4 carriers have decreased sleep quality and increased insomnia, and this could affect the hallmarks of AD, such as amyloid deposition and tau pathology. A recent study conducted in 101 cognitively normal adults (average age 63 years; with 65.3% females) shows that lack of sleep correlated with CSF biochemical markers of AD (low Aβ42/Aβ40 ratio, increased total Tau/Aβ42; pTau/ Aβ42 ratios) (Sprecher et al., 2017). Although supporting a correlation between sleep quality and amyloid/tau pathology, this study did not report any effect on synaptic dysfunction, indicated by neurogranin levels. Because sleep is known to affect AD and vice versa through a reciprocal, positive feedback loop (see Vanderheyden et al., Dual Perspectives companion article; Gerstner et al., 2012; Ju et al., 2014), it would be interesting to see how dysregulated sleep affects synaptic markers in patients with mild cognitive impairment or AD. Mechanistically, the interstitial concentration of Aβ, as measured by microdialysis in mice, correlates with wakefulness (Kang et al., 2009), and synaptic activity is associated with increased release of Aβ (Roh et al., 2012). A reason for this increase in Aβ with higher synaptic activity during wakefulness could be that synaptic activity increases endocytosis (Cirrito et al., 2008) and endocytosis is essential for Aβ production (Rajendran et al., 2006, 2008; Udayar et al., 2013; Ben Halima et al., 2016). Another explanation is that sleep increases Aβ clearance (Xie et al., 2013) and that sleep deprivation affects both Aβ production and clearance, thus mechanistically explaining the higher amyloid deposition in sleep-deprived patients (Osorio et al., 2011; Lim et al., 2013; Spira et al., 2013; Minakawa et al., 2017). Although Xie et al. (2013) focused on the fluxes of interstitial space and metabolic exchange and did not specifically address the role of microglia in this process (Xie et al., 2013), it is interesting to note that sleep affects microglial activity (B. Zhu et al., 2012; Ingiosi et al., 2013; Bellesi et al., 2017); thus, impaired sleep might affect microglial clearance of Aβ. Indeed, addition of orexin, the crucial molecule that regulates the sleep–wake cycle in mammals, to BV-2 microglia cells impaired microglial phagocytic activity and Aβ clearance (An et al., 2017), confirming the studies by Xie et al. (2013). Sleep deprivation is associated with dramatic changes in microglial morphology and increase in proinflammatory mediators both in hippocampus and plasma of adult rodents, which mediate impairment in spatial memory (Guan et al., 2004). In addition to neurotoxic effects triggered by neuroinflammation, recent evidence indicates that glia-mediated synapse elimination could also represent a possible mechanism by which sleep deprivation affects cognitive function. Bellesi et al. (2017) reported that, whereas acute sleep deprivation induces astrocytic phagocytosis, chronic sleep restriction promotes microglial phagocytic activity of synaptic structures, as evidenced by serial block-face electron microscopy in the mouse frontal cortex. Sleep deprivation is associated with the upregulation, albeit moderate, of both Mertk, the receptor, and Gas6, the ligand, involved in astrocytic phagocytosis, which could explain the increased loss of synaptic structures. Interestingly, Gas6 protein is known to bind to phosphatidylserine, a lipid externalized in apoptotic bodies (Ravichandran, 2010; Morizono et al., 2011), which activates Mertk, a process that also could occur during sleep deprivation-induced synapse loss. Furthermore, chronic sleep restriction is also associated with increased levels of C3, a known mediator of synapse elimination by microglia (Bellesi et al., 2017). The involvement of microglia specifically in chronic, but not acute, sleep deprivation further highlights a possible link between long-lasting sleep dysregulation associated with AD and microglia-mediated synapse loss. 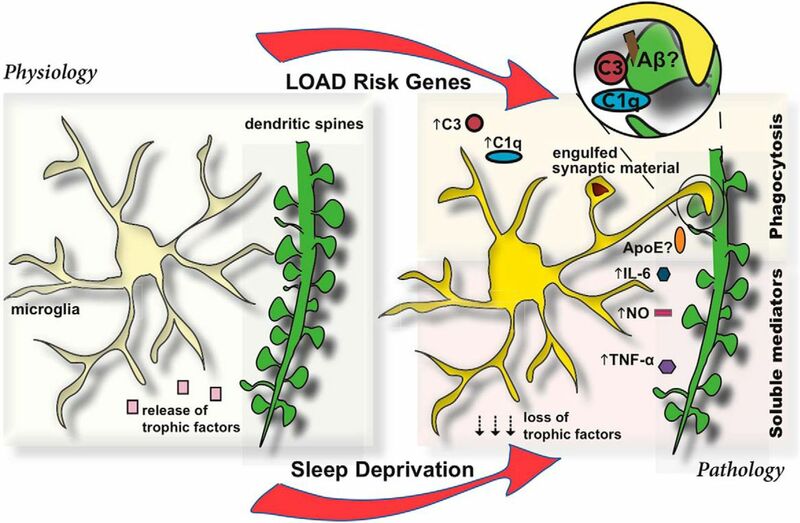 Overall, these studies clearly demonstrate that sleep loss has the potential to modulate synaptic remodeling by microglia, thus contributing to the risk for AD (Fig. 1). From these overwhelming, but fragmented, findings on microglia and sleep, it is indeed tempting to hypothesize that sleep pattern disturbance could enhance microglial (and also astrocytic) phagocytosis of synaptic structures, and this could be exacerbated in AD, thus contributing to the cognitive dysfunction in the disease. As described in this Dual Perspectives article, substantial evidence exists for microglia-mediated synapse loss in AD. If this is the case, it is imperative that we consider this as a target for therapy and management, but with caution. From these data, it is clear that we need to exercise caution when it comes to increasing microglial phagocytosis to enable clearance of Aβ. Such measures need to make sure that, whereas clearance of Aβ is increased, microglia-mediated synaptic loss needs to be avoided. Recently identified “don't-eat-me” signals, such as CD47 and its receptor SIRPα (Ravichandran, 2010; Brown and Neher, 2014), regulate synapse–microglia interactions and could protect from synapse loss. Inhibiting complement molecules, particularly C1q and C3, is an attractive approach and has given promising results in preclinical mouse model studies. Because many of these factors collaborate in synergy (e.g., ApoE, Aβ, complement) in inducing synaptic loss, targeting one or more of these components could be effective in stabilizing synaptic structures. As a lifestyle factor, overwhelming evidence suggests that sleep quality could modulate synapse loss through such phagocytic processes; and because sleep deprivation is one of the main risk factors for dementia, particularly AD, measures to improve sleep quality might reduce cognitive decline in at-risk patients. In conclusion, despite data supporting a critical role for microglia in inducing synapse loss in AD, further work is clearly needed to delineate the cellular and molecular mechanisms involved. A better understanding of the molecular mechanisms underlying microglia-mediated synapse loss (i.e., a direct phagocytic uptake or removal of weakened synapses), elimination by released soluble factors, etc., is urgently needed for designing effective therapeutic approaches. Whether inhibiting microglial removal of synapses could improve cognition and could represent a viable treatment for AD patients, it is an exciting possibility and surely warrants further investigations. Exciting times are ahead in this area for both basic and applied research. This work was supported by Velux Stiftung, Synapsis Foundation Alzheimer Research Switzerland ARS, Swiss National Science Foundation, National Science Foundation Sinergia Grant, and National Science Foundation Interdisciplinary Core Grant to L.R., R.C.P. was supported by Forschungskredit University of Zurich and Synapsis Foundation. We thank the members of the L.R. laboratory for help with proofreading the manuscript. Relationships between AD, microglia, and the complement cascade are evident. C1q and C3, components of the complement cascade, are involved in microglial phagocytosis (Stevens et al., 2007) and are upregulated in AD mice (Reichwald et al., 2009). Injection of Aβ oligomers into wild-type mice increased C3 levels and promoted microglial-mediated synaptic loss (Hong et al., 2016). However, the role of the complement cascade is still poorly understood. For example, C3 deficiency in AD mice with increased amyloid accumulation showed reduced synapse loss (Shi et al., 2017), and C3 deficiency in another AD mouse model reduced microglial phagocytic activity yet enhanced Aβ degradation (Czirr et al., 2017). Other work has found that activated microglia are sufficient to induce “A1” neurotoxic astrocytes, and ∼60% of GFAP-positive astrocytes in prefrontal cortex of postmortem human AD brains were C3-positive (Liddelow et al., 2017), suggesting that an interplay between microglia and astrocytes may be just as important as microglial/neuronal interactions. Traditionally, microglial phagocytosis has been thought to be mediated by C1q and C3, but data from Liddelow et al. (2017) suggest that C3 expression in astrocytes may also contribute to disease state in human AD. Controversy remains as to whether there is a direct association between amyloid load and C3-mediated synaptic loss, and whether components of the complement cascade implicated in neurodegenerative disease are exclusive to microglia. Relationships between AD, microglia, and sleep may also be intriguingly interconnected. As sleep has an emerging role in the pathogenesis of AD (Lim et al., 2014) and chronic sleep deprivation results in activation of microglia (Bellesi et al., 2017), a role for microglia in AD may in part depend on the sleep state of the individual, as it does in astrocytes. Rajendran and Paolicellli cite evidence supporting the effects of sleep disruption on microglial activity, including upregulation of C3 following long-term sleep loss (Ingiosi et al., 2013; Bellesi et al., 2017). However, data indicating how impaired sleep might affect microglial Aβ clearance have been limited, and the role of sleep in activating the complement cascade in the context of neurodegenerative disease remains elusive. Future studies on microglia and astrocytes are therefore needed to define the reciprocal relationship between sleep disturbance and AD progression, particularly in the accumulation of Aβ plaques (Lim et al., 2014; Leyns and Holtzman, 2017).